Tile is widely admired due to its elegant look. Homeowners appreciate laminate because it is easy to clean and affordable. 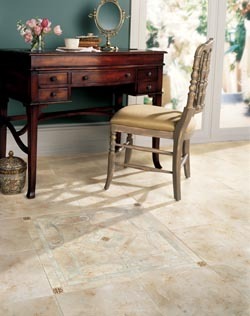 Get the best of both worlds with a tile laminate floor that updates your home with appeal and value. Shop for tile laminate flooring in Yorkton, SK, at our expansive showroom to find great deals on products from some of the industry’s top brands. Thanks to modern manufacturing advancements, laminate is now more resilient than ever. Furthermore, the way laminate is manufactured allows it to replicate the appearance of any flooring material-- including the many different varieties of tile. Whether you prefer the look of ceramic, marble, porcelain, natural stone, slate, or another kind of tile, there is a laminate product for you. Visit us to explore our immense inventory and discover the ideal product for your project. Our tile floor store carries items from a number of respected brands, each with dozens of different styles available. No matter what your design goals are, you are sure to find a surface you love at our store. Looking for something subtle and classy for a professional setting? How about a bright, bold floor that makes a statement? There are products in our inventory such as carpeting and hardwood flooring for every kind of home improvement and business renovation project. If you are not sure just what you are looking for, there are several displays set up in our showroom to inspire you and help you imagine how the tile laminate flooring will look in your property. Talk to our sales associates to get in-depth information on the various products available to you. Our staff members are always happy to make recommendations tailored to your goals and budget. Just let them know what kind of styles you prefer, what your practical needs are, and what price range you are shopping in. Based on this information, our sales associates can help you locate the perfect surface. Leave the hard work to the professionals by utilizing our store’s installers. We have our own installation team on staff, so there is no need to hunt for qualified contractors and spend time interviewing installation vendors. Proper installation is crucial to ensuring your new floor looks its best and lasts its full lifetime. That is why we have our own crew of certified contractors who are trained to correctly install every flooring product we sell at our store. Contact our store for more information on the advantages of tile laminate flooring. We proudly serve customers in and around Yorkton, Willowbrook, Melville, and Broadview, Saskatchewan, as well as areas in Manitoba.